Have you stumbled across the Close Friends feature on Facebook? It appears as an alert as you log in to your Facebook profiles. A very welcome feature indeed considering large networks of friends one gathers over time. With friends of friends, work acquaintances, random people, far off relations, absolutely unknown people and all of their status updates filling up your wall, Facebook as a true friends’ network was not serving at its optimal best. A chance to see only posts from significant few who matter the most is a welcome change. So here’s what the Close Friends Feature does. It suggests and allows you to star the select few friends whose updates you want to know about the most. What’s even better, these friends will not know you tagged them, so this is a little secret between you and Facebook’s backend program. You can change and alter this list whenever you want. 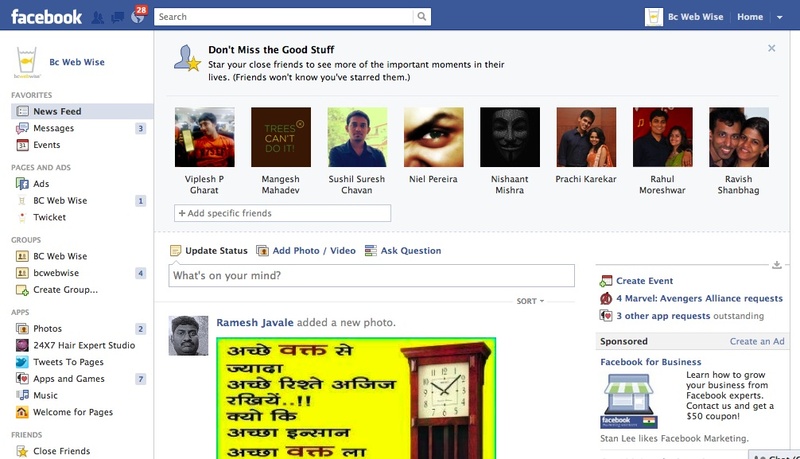 Everytime you open the Facebook page you can select the Close Friends option and see only news feeds from them. Essentially Facebook has taken its `lists’ feature and taken it a step further making it simple and quick for users to follow who they want to the most and minimizing the clutter. What does this mean to posts made on Brand Pages ? Currently the wall posts made by brands on their brand pages go into the news feeds of the fans that have `Liked’ them just as the status updates of those in the friends networks of their fans appear. Once the Facebook user opts for the Close Friends option however, they will see only the posts made by these close friends! In other words the status updates or wall posts made by brands are likely to never get seen at all by Facebook members because they can only select `Friends’ or `People’ and not pages or groups that they follow! So time for Facebook to introduce a ‘Pages I Follow’ listing, that will enable users to also track the brand posts they would like to see. This will not only be user friendly, but will really help to give better visibility of brand posts to serious fans.